Seattle’s interim transportation director warns that bus-lane restripings and signals for Fifth and Sixth avenues, and more ORCA fare-card readers on Third Avenue, might take beyond March 2019 to complete. Seattle might not have new bus lanes ready by the time travelers need them next March to deal with the eviction of 570 buses a day from the downtown transit tunnel. This latest congestion challenge is related to the Washington State Convention Center expansion project, which won City Council approval Monday to build on city-owned alleys. The council didn’t dawdle. Its 9-0 vote hastens the so-called “period of maximum constraint” for traffic, while construction of private towers, the convention center and transportation projects in central Seattle overlap for three years. The $1.6 billion convention- center project will break ground this year. A temporary ramp will help buses use and exit the tunnel near the Convention Place bus station. But construction will proceed fast enough to oust the buses entirely in March, instead of a later September 2019 date some elected officials wished for. Goran Sparrman, Seattle’s interim transportation director, warns in a memo that bus-lane restripings and signals for Fifth and Sixth avenues, and more ORCA fare card readers on Third Avenue, might take beyond March 2019 to complete. Talks are still underway about whether the city will convert a lane of Sixth Avenue into a bus-only lane, said Bill Bryant, Metro service development manager. Other upgrades, such as signals to give buses a head start, can be installed regardless, he said. The One Center City program by local government to synchronize transportation projects, in an effort to prevent crippling congestion, seems to have unraveled since January. The First Avenue streetcar build out is suspended amid rising cost estimates, while a Fourth Avenue bike lane was postponed three years. The Alaskan Way Viaduct may close permanently in October, and displace Viaduct buses to slower Pioneer Square streets a couple months earlier than expected. Like quarterback Russell Wilson, the traveling public must scramble. 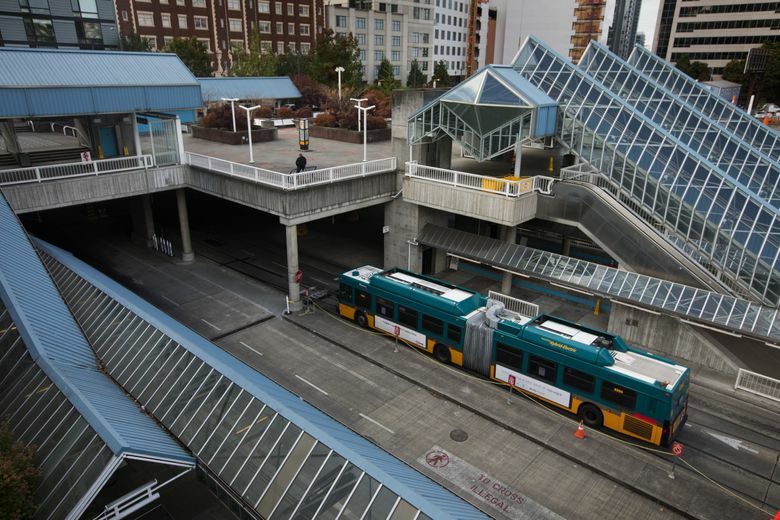 An earlier concept to end eight Highway 520 bus lines at the University of Washington light-rail station, to lessen bus traffic downtown, has been pared down to just Route 255 from Kirkland, that runs in the tunnel now. Metro says riders and suburban leaders wanted to keep their one-seat ride between the Eastside and downtown Seattle, instead of being forced to change to trains at UW Station. Bryant said he believes collaboration is going well to build One Center City capital projects, like a better Third Avenue ORCA network, even if it’s “probably less of a bus service project.” He notes that Metro will increase bus trips in September, to keep frequent service where downtown speeds bog down. • ORCA readers are meant to help people deduct fare at the sidewalk, so they can enter through all doors rather than clog the front door to pay. But to install them requires sidewalk drilling and electrical rewiring. • The extra Fifth Avenue bus lane needs “moderately complex traffic signal modifications,” because it runs through a ramp where I-5 express lanes pass beneath the Seattle Municipal Tower at Columbia Street. • Metro won’t be ready until September 2019 to shorten Route 255, which will go for a half-year on clogged downtown streets. Other changes can move faster, he said, such as signal re-timing to reduce conflicts between general traffic and buses on Second and Fourth avenues, or tighter limits on when private cars can enter the Third Avenue bus corridor. Last year, the convention center and its development partner, Pine Street Group, announced more than $92 million in benefits after negotiating with organizations called the Community Package Coalition. The money will help fund affordable housing, spruce up Freeway Park and renovate the Pike Street-Pine Street corridor for pedestrians and bicyclists. Convention Center developer Matt Griffin said it took 3 ½ years to plan and pitch the expansion, so Monday’s vote didn’t seem quick to him. As for the unsettled transportation scene, he mentioned the 2005-07 tunnel closure to rebuild train trackway, that turned out not to be an apocalypse. On the other hand, 50,000 more people work in the central city now.